There it is....thouroughly deserved. They are a quality football team. 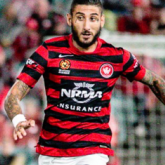 Pressure should be on popovic imo but alot of you will disagree. We seem to lose the same way every ***** week. Agree with Em. That game deserved a draw. But send off cost us. Ah well. We move on. We did as we failed to convert golden chances of our own, our composure is farked and we bottled a lead...Again for a 3rd time in a month...Adelaide never gave up, played their passing style and eventually got the result they pushed for. Does anyone on here think we can win a game this season? In the end I don't blame Popa for this, the formation and tactics worked to an extent. Nobody could shoot and players really effed up when they only needed to do something easy. Low confidence is why. Next season is our chance to turn this around. On attack, we are the worst team in the comp. Enough of this we were unlucky BS. If you can't string three passes together, you will not win games. The midfield is just diabolical. Look on the bright side. This stuffs us up ESFC. Our season was always gone. We have problems on another whole level. Next week is when we really need to win. This doesn't bother me that much as it just exposes the obvious problems we have which need to be fixed. Hopefully someone takes notice..
there were some promising signs up front tbh. we took it to Adelaide late in the game, we had a couple of opportunities to score/win. just falling asleep at the wrong moments unfortunately. Look on the bright side at least ESFC aren't any better off after their win today. Next week at the derby "We only lost to f*ck you up, we only lost to f*ck you up!" That is 12 points right there we should have gone on to claim. Enough said we cause our own problems. Someone needs to take responsibility for it. Kalmar is out of the squad now I believe. Nothing to do with the strip mate. How much does it mean to beat us, hear them at the end? also their casuals emptied the bay just before the poznan and went running to the far corner dont know what was happening there. I cannot stand losing like that ever since brisbane grand final. If we need an injury replacement for Santalab he could come in to the squad.